Travel in comfort through the heat of the desert, traveling past an extinct volcano, Fortification Hill before enjoying a 30-minute helicopter flight over the Dragon's Corridor. We will pick you up at your Las Vegas hotel in one of our luxury motorcoaches, equipped with restrooms, television, reclining seats, large panoramic windows, and air conditioning. Your professional driver and guide will provide expert narration throughout your tour on the road to the Grand Canyon, we will go past an extinct volcano, Fortification Hill, which is part of the Black Mountains Range. Arriving at one of “The 7 Wonders of the Natural World!” - the Grand Canyon. The Grand Canyon is a natural formation distinguished by layered bands of red rock, revealing millions of years of geological history in cross-section. Vast in scale, the canyon averages 10 miles across and a mile deep along its 277-mile length. The highlight of the tour is a 30-minute helicopter flight over the Dragon's Corridor showing you the most spectacular views of the ancient geological rock formations of the Grand Canyon and the Colorado River. 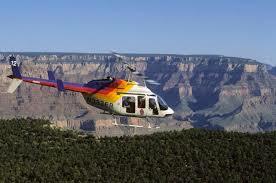 Before leaving the Grand Canyon we will make one last scenic stop at Bright Angel Lodge on the Rim. Your park admission and lunch is included on this tour. Lunch consists of a deli-style lunch, deli sandwich or chef salad, choice of side and beverage. After completing your Grand Canyon South Rim Bus Tour, contact reservations to set up your complimentary afternoon Hoover DamExpress tour.